Mayceys Sour Grapes - SANZA packed from bulk. 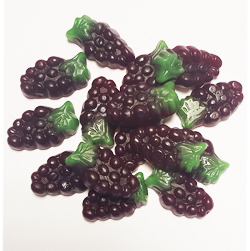 Chewy sour grape flavoured sweet. GLUCOSE SYRUP, SUGAR, WATER, GELATINE, ACID MODIFIED MAIZE STARCH (E1401), FOOD ACIDS (E330, E296), FLAVOURS, COLOURS (E102, E123, E133, E171).